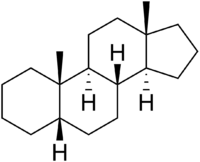 Androstane is a C19 steroid with a gonane core. Androstane can exist as either of two isomers, known as 5α-androstane and 5β-androstane. Synthetic androgens and anabolic steroids are androstane derivatives. Some progestins, such as ethisterone and dimethisterone, are also androstane derivatives.